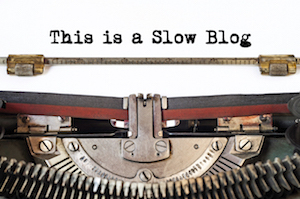 Slow Blogging applies the slow philosophy to the blogosphere. It eschews the current blogging paradigm of “faster equals better” and that posting blog entries frequently is necessary, or in fact, that posting frequently is the “right way” to blog. This blog “happens when it happens” and will be updated as and when I have something I think is really worth sharing, rather than just writing something to get an entry in (often just to keep the search engines happy!). Which means you may get an entry a week, a month, or even several a day, depending on what I have to say and what I am up to. Because this is a slow blog and by its very nature not updated regularly (I aim for once a week, often I miss), may I suggest you subscribe by RSS by clicking here, or subscribe to receive email updates by clicking here. If you are new to blogging and RSS and not sure what all that means, click here for an FAQ. Inspired by Todd Sieling, below is my Slow Blogging Manifesto (this is only a first draft and may, or will, change). To read Todd’s own manifesto click here (and I can’t help but have some of my manifesto very similar to some of his, one I have quoted directly, as I cannot say it better myself…). 1. Slow bloggers blog for people, not search engines, page ranks or technorati authority. 3. It is a willingness to keep quiet whilst all other bloggers are shouting “listen to me, listen to me!” It is about not trying to be the loudest voice out there. 4. Slow Blogging is not about chasing the news or Google hot trends just for a few hits. It is about not sprinting to a response or reacting to this rush of information in our world of 24 hour rolling news. The world is moving fast and trying to keep up means often that you sacrifice quality for speed. Slow blogging looks at the bigger picture not at micro-trends. 5. Slow Blogging concentrates on one thing at a time. 6. 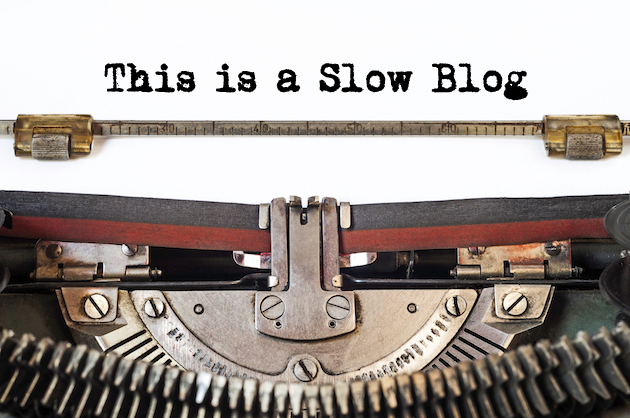 Slow Blogging is about substance to posts, not just banal clichés and one-line sound bites that sound good but are ultimately vacuous. Think. Study. Consider. Write. Then post. 7. The posts won’t rush to get to the point; they will take you on a journey. Some entries may be rambling and long winded (that is, in fact, a good thing. James Joyce didn’t rush Ulysses…).